My cat stopped using her litterbox. What can I do? Litterbox issues are one of the most common reasons why cats are surrendered to the Wisconsin Humane Society. 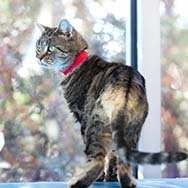 Often, the litterbox issues are caused by medical ailments such as Urinary Tract Infections. Have your cat examined by a veterinarian for any physical problems. Be sure to mention your cat's urination and defecation habits. If a cat's elimination is painful because of a Urinary Tract Infection, the cat may associate the litterbox with pain and choose to eliminate elsewhere. When your cat is healthy again, a careful reintroduction to the box will be necessary. Whatever the cause for the inappropriate elimination, a brief confinement period may be necessary in order to clean the soiled areas, place deterrents in these spots and purchase more litterboxes or new litter. 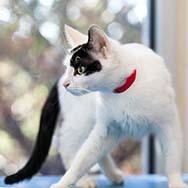 The confinement room should be a comfortable room and should contain two litterboxes, fresh food, water, a bed and toys. (Remember not to place the litterboxes near the food and water.) Visit your cat regularly, but don't let him out until the home environment has been cleaned and the litterbox situation has been improved. (Please note that extended periods of confinement may be detrimental to the re-training process, so move quickly to make these changes.) When your cat is given full house privileges, it is important to praise the appropriate behavior. In order to thoroughly clean the urine-soaked areas, a black light may be needed to identify the problem spots and a strong enzymatic cleaner should be used to saturate and neutralize them. Simple Solution has proven to be highly effective. To repel kitty from previously soiled areas, cover them with a vinyl carpet runner (upside down), a solid air freshener (preferably a citrus scent), or bowls of dry cat food. Solving house soiling problems is possible with patience, persistence and a systematic plan for retraining. If you would like to work with a Wisconsin Humane Society behaviorist one-on-one regarding this behavior topic, please call 414-431-6173 or email behavior@wihumane.org to schedule a consultation.